Each year, thousands of adults in the United States suffer from serious illnesses that could have been prevented by vaccines. These diseases can be serious and require you to go to the hospital or be out of work for a long time. 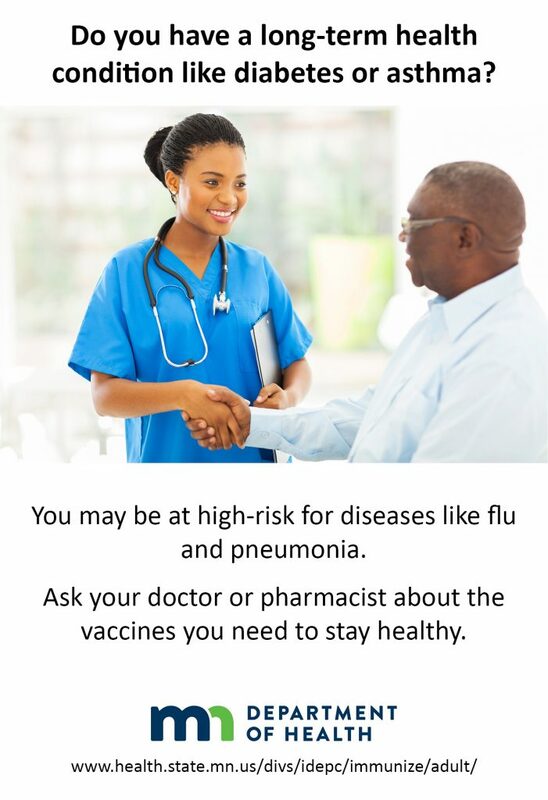 Many adults simply do not know they are at high risk for diseases like influenza (flu) and pneumococcal, which vaccines can prevent. Many long-term health conditions like diabetes or asthma place adults at higher risk for problems if they get sick. Some diseases are more common or more dangerous as adults get older, like shingles. Some adults may not have gotten certain vaccines because they were not available when they were children putting them at risk for the disease. It is important to talk your doctor or pharmacist about vaccines you need to stay healthy. Flu: Everyone 6 months of age and older should get vaccinated every year. It is especially important for young children, pregnant women, older people and those with long-term health conditions. Tetanus, diphtheria, pertussis (Td or Tdap): All adults need a Tdap vaccine one time, and then a Td vaccine every 10 years. Pregnant women need a Tdap vaccine during every pregnancy to protect them and their newborns. Measles, mumps, rubella (MMR): Many adults need a second dose of this vaccine to be fully protected against the measles. This vaccine also protects against mumps and rubella disease. Varicella, also called chickenpox: You may need this vaccine if you never had chickenpox disease. Human papillomavirus (HPV): If you are 26 or younger, make sure you have been vaccinated to prevent certain kinds of cancer. Zoster, also called shingles: Adults 50 and older need this vaccine to be protected against this disease. Shingles disease can cause a very painful rash that may last for several months. If you already got a shingles vaccine, talk to your health care provider because there’s a new vaccine for shingles that you should get as well. Pneumococcal: There are two types of pneumococcal vaccine, ask your doctor if you need both. The vaccines help prevent infections in the lungs, blood, and lining of the brain or spinal cord. Meningococcal: This vaccine protects against a rare but dangerous infection. Hepatitis A and B: These vaccines protect you from viruses that cause liver disease. If you travel outside of the United States, you may need additional vaccines. You may also need certain vaccines because of your job, for example if you are a health care worker. Your health care provider can help you determine what vaccines you need. We all need vaccines throughout our life to stay healthy. Talk to your clinic or pharmacist about what vaccines you need. Don’t let cost stop you from getting vaccinated. Adult vaccines should be covered by health insurance. Call the number on the back of your insurance card to ask about vaccine cost. Uninsured adults and adults whose insurance does not cover vaccines may receive them at low cost at a clinic enrolled in the Uninsured and Underinsured Adult Vaccine program. Go to Vaccination Clinics Serving Uninsured and Underinsured Adults: http://www.health.state.mn.us/uuavsearch.